This year was my first time attending the HIMSS conference. I definitely like to be prepared, so I took advantage of the pre-conference materials such as guidebooks, maps, and an hour-long webinar orientation in the week before the event. I knew McCormick Place was a large venue and I knew HIMSS would have a lot of attendees, but when I walked in Sunday afternoon, I felt like yokel in the big city for the first time “Golly gee, this sure is a big building!” And that was just the lobby of the North Building – one of four (plus a hotel) that make up McCormick Place. I spent most of Sunday on the hunt for a suit jacket that would become my very first Walking Gallery jacket. In fact, Regina Holliday would be painting it in the HIStalk booth during HIMSS! The jacket had to be perfect because I plan to treasure it for years to come, but it also had to be stylish since I intend to wear it every chance I get. As a patient suffering from a variety of symptoms that include pain, fatigue, and brain fog, it’s important to me to look my best as a way to compensate. Although I have an undergraduate degree in design and a masters in business, my symptoms often cause me to feel inadequate. In a crowd of healthcare professionals, I still often struggle to be taken seriously as “just the patient.”Never mind the fact that my 21 years of daily on-the-job experience often exceeds that of other healthcare professionals. Garment bag in hand, I arrived for the first party of HIMSS — the speakeasy-themed opening reception. It was impossible to spot anyone I might know in the huge, dark ballroom. Eventually I met Vincent McGee, a healthcare IT executive from Atlanta. He later emailed me to say that one of the highlights of HIMSS was the conversation we had. Later, I found Colin Hung, someone I have known online for years but never met. In fact, earlier this year, Colin volunteered to call my mom and walk her through the live stream set up so that she could watch me in a keynote panel at Stanford. These types of friendships exemplify social media and the online health community for me. At the end of the party, I finally met up with Regina. Of course she had been held up on the way to meet us, recording an impromptu interview calling for everyone in America to request their medical records on July 4! Next, I was on to a glitzy party at the top of Wit hotel, where I met up with friends and basically ate my weight in cheese and bread. This event was notable as a place where I finally met #HITsm maven Mandi Bishop. I was warned that these parties have a reputation for people drinking too much and getting a little “handsy.” I am grateful to my friends for allowing me to tag along to some parties, never making me feel out of place for not being an HIT insider and, of course, not getting handsy! I only had one drink and turned in early because I had a long, busy Monday ahead of me. In Chicago, I used the city bus and the subway system to get around. Monday morning I walked a block, picked up a dozen Dunkin’ Donuts, and caught the city bus for the mile ride to McCormick. I didn’t know anybody at the Walgreens / Alex Gourlay keynote, but I made friends with the gentleman sitting next to me, who had attended all the way from England. We discussed the pros and cons of the NHS vs. the American healthcare system. After the keynote, I offered donuts to the people sitting near me. Then it was off for the exhibit hall. I ended up spending most of Monday and Tuesday in the exhibit halls, and even then I was not able to walk past every section, let alone visit even a fraction of the booths. In fact, there was allegedly an entire disaster response section with a tractor-trailer that I never even saw. The exhibit halls, occupying the North and South Buildings of McCormick Place, totally blew my mind for a number of reasons. In a past life as a graphic designer, some of my work involved designing exhibit booths—of course these were the standard backdrops and pop-ups. 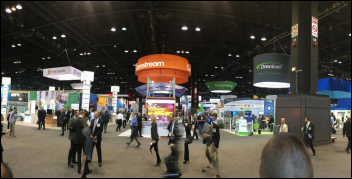 The booths at HIMSS ran the gamut from these small, standard types to truly massive structures, many of which had two levels and included large conference tables or enclosed rooms for discussing business deals. In the weeks prior to the conference, I was surprised at the volume of direct mail I received, each full-color glossy postcard extoling the virtues of one booth or another and describing the fabulous prizes I could enter to win when I visited. This all seemed extremely lavish to me, especially since I know many people dealing with chronic illness who are unable to work and struggle every month covering basic expenses such as $4 prescriptions. The Walgreens keynote mentioned their program to donate a vaccine to an underprivileged person in a third-world country for each customer who purchased their vaccine at Walgreens. I wonder how many vaccines could be provided with the money spent at HIMSS? In fairness, I should say that once I experienced the exhibit floor, the lavish giveaways seemed more practical. I certainly made sure I attended my pre-booked appointment at the Mirth booth. How did I decide to book this 30-minute demo? They promised a Fitbit fitness tracker to every person who completed their demo. I am happy to report that they treated me fairly, explaining their products to me and giving me the Fitbit without complaint. The really neat thing about demos like Mirth’s was that it afforded me a rare opportunity to experience HIT tools from the provider side, something I’m not likely to see an my next checkup. I’m sure that for many vendors, offering prizes and giveaway offers better ROI than large, flashy booths. As a consumer and a patient, I want vendors to keep their costs as low as possible. I am not convinced that a gigantic booth at HIMSS actually pays off. I was definitely concerned about how vendors would react my presence. I was “just a patient” and I definitely did not have thousands or millions of dollars to spend on their products. Thankfully, Mr. HIStalk reassured me prior to the conference that he would happily call out any vendor who treated us especially poorly. It’s not that I wanted to get people in trouble, but fear of reenacting the shopping scene from the movie “Pretty Woman” kept playing through my head. Luckily the vendors I visited at HIMSS pleasantly surprised me. I did have one vendor tell me not unkindly that they didn’t have anything that I would be interested in seeing. Only two unpleasant experiences stand out in my mind. One day I was behind two very unsavory sales dudes as they discussed their annoyance at having their time wasted talking with someone who obviously was not going to make a purchase. Luckily for those guys, I did not see what company they represented. Another instance was when I tried to enter a prize drawing and was met with a bit of a sneer from the woman working there. It might have just been a matter of luck, however, because fellow HIStalk patient advocate scholarship winner Amanda told me that she did not have very pleasant interactions with many of the vendors. I was relieved that the most common reaction to my presence was a little confusion and then mostly excitement. On Wednesday I had several hours of demos booked with people interested in my opinion and expertise as a patient. I was also lucky to know a handful of people from previous events or from Twitter who were happy to introduce me to other vendors. Some positive reactions that stand out in my mind are those from the Dell booth, the Panasonic booth, and of course the CTG booth who provided the registration badges for the patient advocates. 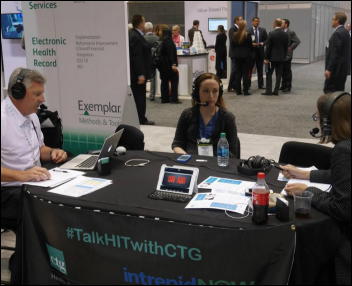 It was such an honor for me to be interviewed by Joe Lavelle and Rayanne Thorn at the CTG booth. I laughed when they thanked me for taking the time to tell my story. As I explained, it’s easy to talk, but the real honor is when someone is willing to listen. 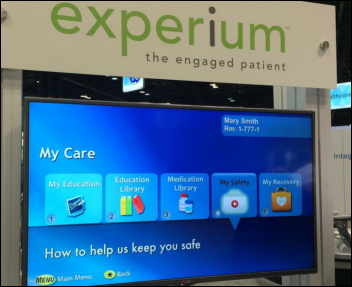 We came up with the idea to have a patient for every booth at HIMSS16. Will your organization step up and sponsor a patient? There were two cool things about the Dell booth. Instead of the usual swag (most of which probably ends up in the trash), Dell had glue guns and flower petals so visitors could make colorful, sparkly flowers which would then be donated to Brooke’s Blossoming Hope for Childhood Cancer Foundation which provides fun headbands to children who’ve lost their hair from chemo. The Dell employees were also really excited to hear that HIStalk had sponsored patients to attend HIMSS. They enthusiastically told me about programs where Dell used feedback from actual patients. While checking out products on the outside of the Panasonic booth, I got called over by an acquaintance to try out their Connected Patient Room Solution. They had a display with information, education, and entertainment for the patient and their caregiver. The system also featured audio technology that could be used to isolate sounds for patients sharing a room (or just those with alarm fatigue). I have no idea how it works, but if you are directly under the speaker, you can hear music (or other audio), but as soon as you shift a bit, you can’t hear anything. The sound also has the effect of drowning out the other noises in the room. The Sonifi Health booth had similar types of displays for patient education and entertainment. They had modules with specifics on medications, and the program could also utilize videos as part of the discharge process. I appreciated that they had an RN on staff to help with education and engagement. From my months in the hospital, I know that nurses interact far more with patients than anyone else, although they often don’t get the respect they deserve within healthcare. The most creative swag was from Nick Adkins, who (lacking a booth) wandered HIMSS wearing a kilt and handing out pink socks with mustache designs to promote his HIPAA-compliant video service Reel Dx. I was happy to trade donuts for socks with Nick and his business partner. 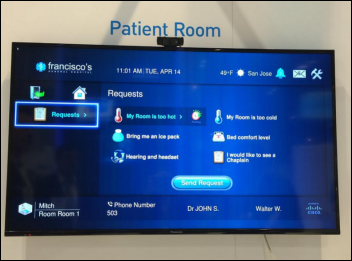 I was pleased that HIMSS had a Connected Patient Gallery, but the actual experience left me disappointed. At one point, they were using the theater to run a trivia game about Walgreens. On another visit, I tried to find someone from Patients Like Me, but only found a video, no actual humans. I spotted some devices to record blood glucose, weight, blood pressure, etc. but the vendor (who admitted their products weren’t capturing the older, less techie demographic) got agitated when I persisted in asking why something like a scale needed to use a smart phone anyway. My older, less techie relatives barely leave their house, and I’m sure transmitting the data via dial up would suffice, if necessary. This strikes me as a prime example of a business not really understanding or caring about their customers. It’s worth noting that I did not see any patients in the Connected Patient Gallery on any of my visits. Overall, I’d give HIMSS a B rating. The event was way too big. I’m concerned about the professionals there to make important business deals for their organizations. There’s no way to keep everything straight and the pace and atmosphere is exhausting and confusing. The keynotes were mostly overly optimistic, glossy commercials presented by rich white men. We need to see more patients on stage. The options for food were so expensive and the lines so long that at one point my favorite booth giveaway was cucumber water. I’m not sure why the transportation was such a problem — Chicago has a train, a subway, and city buses, along with shuttles to nearly every hotel, taxis, and Uber cars. I’m concerned that health IT purchases are being made by people willing to wait an hour for a taxi or pay 4.5x surge pricing for an Uber rather than walk to the curb to catch a bus for $2. The best parts of HIMSS for me all involved people. My favorite thing was meeting up with old friends and making new ones. I loved vendors who were genuinely excited to talk to a patient. It was an honor to be able to tell my story and to represent patients who could not attend. I had a lot of fun live tweeting and was especially happy when my “normal” followers (non-HIT) thanked me for the coverage. The best swag I brought home was the stack of business cards and new connections for future advocacy opportunities. The buzzword for HIMSS seemed to be interoperability. I also heard a lot about engagement and compliance. Hopefully the campaign to bring more patients next year takes off. I think many vendors want to involve patients, but are genuinely baffled about how to do so. I hope that with the presence of more patient advocates at HIMSS, vendors will begin to understand that they must learn how to engage with patients and that we need them to comply with their oaths to serve us. As an exhibiting vendor, I really appreciate this perspective. Even though we talk to patients often, we should do it even more. It’s so easy to get caught up in the “business” and forget that Healthcare is about serving the patient, a person in need. Without them, there would be no healthcare. I feel that all of us as vendors are still just scratching the surface of true patient engagement and would do well to involve patients in every aspect of our businesses. Doctors have to take an oath to do what’s in the best interest of the patient. Why shouldn’t vendors have to do the same? Patientco accepts your challenge to sponsor a patient for HIMSS16! 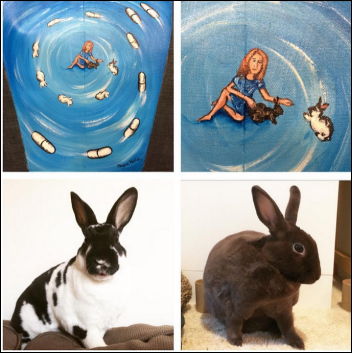 Enjoyed your recap! 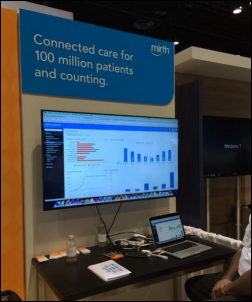 Love this call to action: “We came up with the idea to have a patient for every booth at HIMSS16. Will your organization step up and sponsor a patient?” Fantastic meeting you at the show! Look fwd to hearing more great things from you and patient advocates like you! 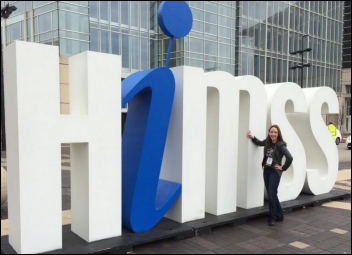 Carly, I love your recap of #HIMSS15! I really enjoyed our conversation at the Dell booth. You inspire me and I hope you consider being part of our next #DoMoreHIT think tank.